West Worcestershire MP Harriett Baldwin joined one of Malvern’s leading family run firms to help unleash a new range of ropes designed for superyachts. 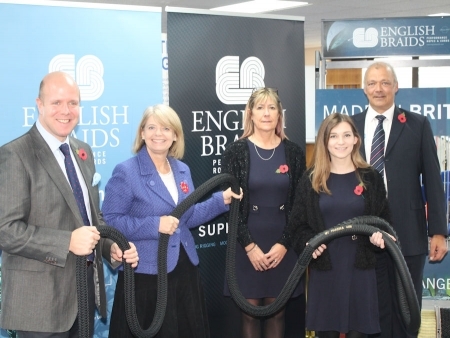 Harriett visited English Braids, which is based in Malvern, to hear about the company’s ambitions plans to sell ropes to the manufacturers of superyachts. The company will be taking part in a world-famous international trade show in Holland next week to unveil an expanded range of ropes and cords. English Braids has been manufacturing ropes and cords for five decades in Malvern and sells to Europe, Asia and the Americas. Harriett met with staff and learned about the company’s plans to expand its business further on the back of the trade show visit to Amsterdam. Harriett Baldwin, MP for West Worcestershire, commented: “English Braids is a fantastic family-run company which has been flying the flag for Malvern for the last fifty years. Henry Earp, English Braids’ sales director, added: “We are strong believers in British manufacturing and are particularly proud of what our teams have achieved over the last 50 years. “Continued diversification is vital to the longevity of British Manufacturing. Our focus on quality over the years has seen us fight off foreign competition through the support of our employees and loyal customers. The Superyacht Pavilion at METSTRADE is the perfect platform to showcase our British manufacturing which is held in high regard within this sector. Photo: Henry Earp, Harriett Baldwin MP, Lauren Bayliss, Tina Aston, Justin Jones.